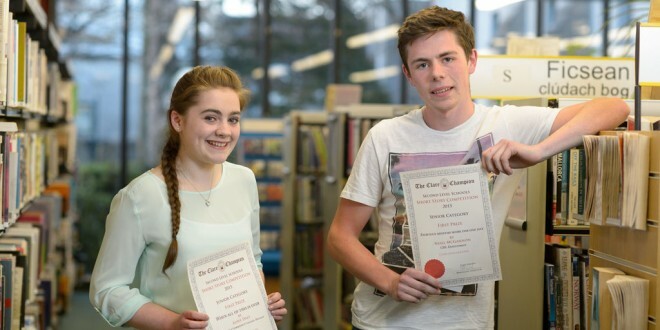 Aoife Daly, who won first prize in the junior category, and Niall McGannon, who won first prize in the senior category, at the prize giving ceremony, for the Clare Champion Short Story Competition, at the de Valera Library. Photograph by John Kelly. 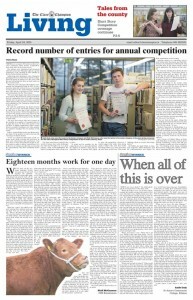 THERE were a massive 493 entries to this year’s Clare Champion Short Stories Competition, more than twice the previous record. The winners were announced and presented with their prizes at a special celebratory event attended by their families at the De Valera Library in Ennis. Addressing all in attendance, Clare Champion managing director, John Galvin said the competition has grown in stature over the years, with this year attracting four times as many entries as the very first event. “When the Clare Champion Short Stories competition was inaugurated back in 2007, it was a step into unknown territory for us, even though we have been in the words business ourselves since 1903 and as a successor to Clare newspapers dating back into the 19th century. He said the competition has drawn interest from all over Clare and South Galway, while he said there is often just a hair’s breadth between the top entries. “Down through the years, we have had entries from every school in the county, as well as Kinvara and Gort, and most have had students who featured on the shortlist at some stage. Editor, Austin Hobbs said he was blown away, not alone by the number of entries but also the vast range of subject matters. “I was very impressed that many of the entrants wrote about everyday life and drew on their own observations and experiences. You don’t have to write about famous people or major events in order to deliver a good story. It is in the lives of ordinary people that you can find the extraordinary; they have wonderful stories to tell. “For those who choose to dwell in the world of fiction, they really challenged the mind and brought you on a great journey. Such stories highlighted the depth of imagination these young writers have. Mr Hobbs also paid tribute to long-time supporter, Mick Hennessey and his young musicians and singers for their contribution to the evening. Aspiring authors are sometimes told to write about what they know and Niall McGannon, the Ennistymon CBS student who won first prize in the senior section, would surely appreciate the wisdom of that maxim. Aoife Daly of St Anne’s in Killaloe won first prize in the junior section and wrote about a struggling family in a refugee camp. “When you see the images of those camps on the news, you really think about it,” she says. Second place in the senior section went to Chloe Walsh of St Michael’s Kilmihil. “I like writing emotional stories,” she said, explaining the background to her story about a man whose wife has long been unfaithful. Seeing the lonely hearts adverts in The Farmer’s Journal was the inspiration for Brian Talty of St Joseph’s Spanish Point, who took third prize in the senior category. His story had the curiosity-provoking title, 60s. Divorced. Non Smoker. “You see them in the paper, things like 50s, looking for someone but you never hear the story behind the ad, so I decided that’s what I’d write about,” he says. Faye Curran of Coláiste Muire in Ennis took third place in the junior section and is already considering a career that will give her a chance to make use of her writing talent. “I’m thinking about doing something that involves writing after college, journalism or something like that,” she says.